Catawiki has a rather weird Bob De Moor item listed since April 2013, namely a cover Bob De Moor would have drawn for a calendar back in 1946. 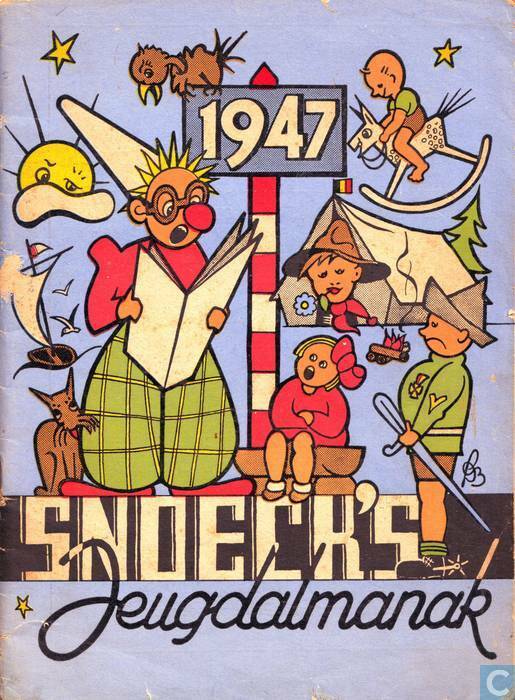 The story goes that in 1946 Bob De Moor was asked to create the frontcover of a 1947 youth calendar to be published by the Flemish Ghent based publisher Snoeck-Ducaju & Zoon. 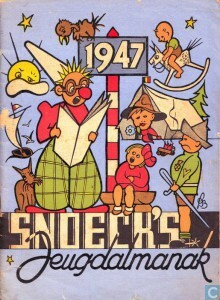 Called ‘Snoeck’s Jeugdalmanak’ this (17 x 24 cm) booklet counts 40 pages. 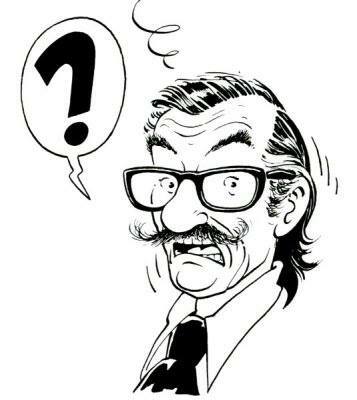 The style used for this particular drawing is very much unlike Bob De Moor‘s work from that same period. In fact he would never draw like this again, so this would have been a very rare one shot drawing. It’s actually only because of the signature that one could identify it as being by Bob De Moor because artistically it has nothing in common with his earlier / later work. And even then, the signature does not correspond with the ‘Bob’ signature he was using at that time, which was written ‘Bob’ and not ‘BoB’ like we have here. In short, unless Bob De Moor was test-driving a new style here, we seriously doubt this cover is actually by Bob De Moor. But… we could be wrong of course. If someone has some more info behind this drawing, let us know. Thanks to Olivier Marin we do know now that there are 3 Bob De Moor drawings inside the booklet itself and these are clearly from Bob De Moor and have been signed ‘R. De Moor’.